About a month ago I was in a second hand bookshop in a little Norfolk town called Beccles. It’s a lovely shop, built into an old Victorian townhouse with book shelves lining the walls of the rooms that had at one point been bedrooms and kitchens and things. It was the second time I had been there. The first was about ten years ago when I went for a long weekend on a riverboat. The boat broke down on day two and so it became a long weekend of playing yahtzee and sitting in the pub near where the boat broke down. But we did manage one trip out on the boat before that happened and it was Beccles we managed to go to. The first time I went I found a lovely old copy of C.S. Lewis’ The Screwtape Letters and the second time I went I found a battered old copy of Nietzsche’s Thus Spake Zarathustra. It was just tucked away on a shelf of old philosophy books and it was so ragged and tattered and characterful that I had to buy it. I tried reading Thus Spake Zarathustra when I was about seventeen. I bought a Penguin copy (a copy it turns out I still have, I have managed to move house six times without noticing I was bringing it with me each time,) and tried my hardest to read it, but it was way over my head. At seventeen I wasn’t quite ready for it. Years later I felt much more equipped for it. I had a slightly better understanding of who Nietzsche was, and what his books were about. In the second half of the book the pages are uncut. I have heard about this in old books before, but had never come across it. I recognised what it was though, as years ago I had had a job laying out pages for small magazines and pamphlets. Books are printed with many pages arranged on a big sheet of paper, which is then folded in such a way that all the pages are in the right order and aligned in the right direction. 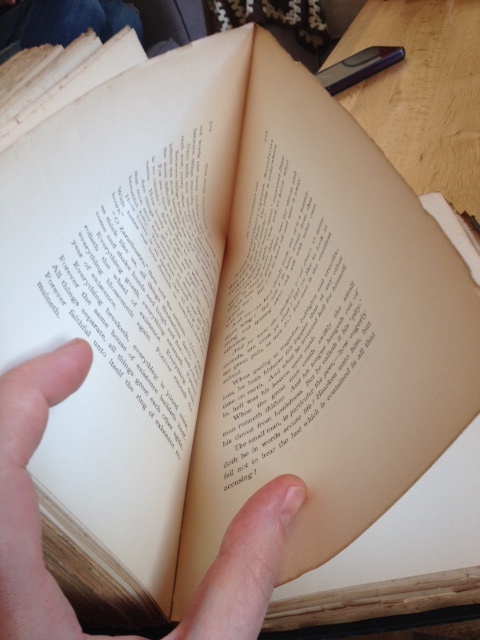 Then the edges are cut to make it into a book that can be read. Years ago, like when my copy of Zarathustra was printed back in eighteen-something-something, this cutting part of the book binding process didn’t always happen. Almost all of the pages in the second half of the book are like this. It is, of course, impossible to read it in this state. In one way I quite like it. It’s a curious little anachronism and maybe even makes the book more interesting. On the other hand, I was enjoying reading it. I know I have another copy of this book upstairs and I could easily finish reading that one instead, but old musty books and just nice things to hold and read. The typesetting in particular is really nice. So the question becomes do I cut the pages, or do I leave it as it is? I have had an offer from a very kind curator of antique books to cut the pages for me so that I don’t mess the book up too much. I do kinda feel, in a weird sort of way, that I ought to let him do it. I want to set the book free. When I bought it I was really into the idea that this old book had been through many sets of hands and I was just the latest in a long history of readers to encounter it. It’s certainly smelly and mucky enough to believe that this thing has been read hundreds of times. 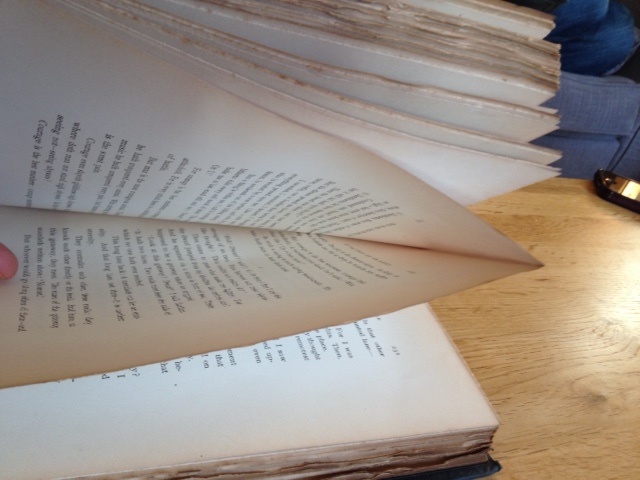 But with uncut pages it becomes clear that no one in over a hundred years has read past the half way mark. Some intrepid typesetter laid out all those pages letter by letter, and no one has ever read the words he laid out. On the other hand uncut pages are a really nice quirky thing to find in an old book and it isn’t something you will come across all that often. The book isn’t valuable (at least I don’t think it is). I did some research on it and I think I paid a very fair £25.00 for it, so I won’t be devaluing a precious antique. To cut or not to cut? I have put the book away for a while so I can think it over. A part of me, possibly an irrational part, imagines that Nietzsche would be annoyed with me for not doing it. Previous Post Can I Tell You About My Twitchy Face?